[Jesus said,] "And when [the Advocate] comes, he will convict the world of its sin, and of God's righteousness, and of the coming judgment. The world's sin is that it refuses to believe in me. Righteousness is available because I go to the Father, and you will see me no more. Judgment will come because the ruler of this world has already been judged." Jesus' promise to his disciples to send the Advocate to them was powerfully demonstrated on the day of Pentecost after his resurrection (Acts 2). Peter and the apostles were filled with the Spirit and boldly spoke the Gospel of Jesus Christ. People were convicted in their hearts and believed that Jesus was Lord and Christ and were baptized. They were forgiven of their sins, received the gift of the Holy Spirit, and began a new life of righteousness. 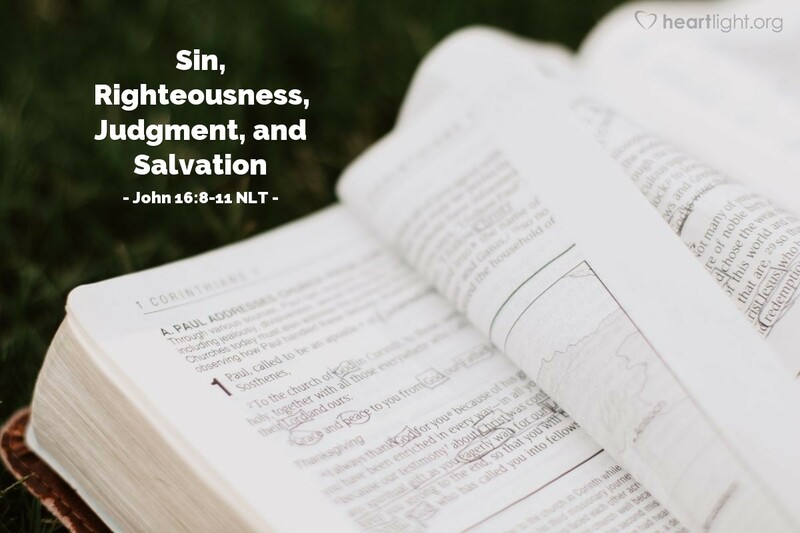 The Spirit brought conviction of sin and judgment, showed them the way of righteousness, and led them to salvation, just as today's verses say! The Spirit still does the same today. Let's ask that God empower us and our words through his Holy Spirit so the lost around us can know the truth of Jesus! Holy and righteous Father, as your child, I know that your Holy Spirit lives in me. I ask, dear Father, that you empower my influence and my words by your Spirit so that they will be appropriate and powerful as I try to lead my friends to your salvation in Jesus, in whose name I pray. Amen.